It didn’t look like life was going to be easy for Millie Jackson who was born in the city of Thomson, in Georgia, on July the ’15th’ 1944. Her father was a sharecropper and worked long hours for little reward. Life was tough for the Jackson family, and got tougher when Millie Jackson’s mother became ill and passed away while her daughter was still a child. The family was devastated and Millie Jackson and her father decided to move to Newark, New Jersey, where they lived with an aunt. This was a new chapter for the Jackson family. By the time Millie Jackson was in her mid teens, she had moved to Brooklyn, and was working as a model for Jive and Sepia magazine. Millie Jackson’s luck was starting to change. One night in 1964, a friend dared Millie Jackson to enter the talent contest at Small Paradise nightclub in Harlem. Millie Jackson who was just sixteen decided to enter the talent contest which she won. Little did Millie Jackson know that this was the start of long career as a singer. Five years later, in April 1969, Millie Jackson released her debut single A Little Bit Of Something on MGM Records. After the single failed to trouble the charts, Millie Jackson signed to Spring Records in 1970 and began a long association with the label. At Spring Records, Millie Jackson was paired with the label’s in-house producer, Raeford Gerald who produced her 1971 single A Child of God (It’s Hard to Believe). On its release, it reached twenty-two in the US R&B charts and became Millie Jackson’s first single to chart. The following year, 1972, Millie Jackson released Ask Me What You Want which reached twenty-seven in the US Billboard 100. Soon, two became three, when My Man, A Sweet Man reached forty-two in the US Billboard 100 and seven in the US R&B charts. Both these songs featured on Millie Jackson’s eponymous debut album. When Millie Jackson was released later in 1972, it featured a collection of songs which seemed to have been influenced by the Motown sound. However, this proved popular and Millie Jackson reached 166 in the US Billboard 200. Millie Jackson’s career was underway. In 1973, Millie Jackson returned with her sophomore album It Hurts So Good which this time, was produced by Raeford Gerald and Brad Shapiro. The pair was responsible for an album where Millie Jackson’s sound started to evolve, and move away from her Motown influenced debut album. However, It Hurts So Good stalled at 175 in the US Billboard 200, but reached thirteen in the US R&B charts. This was an improvement on her debut album Millie Jackson. Just when Millie Jackson’s career seemed to be going places, her third album Got To Try It One Time which was released in early 1973 failed to even trouble the lower reaches of the charts. For Millie Jackson this was a disaster for the twenty-nine year old, who began to wonder when she would release a successful album? Her first two albums had stalled at the lower reaches of the US Billboard 200, and now Got To Try It One Time had failed commercially. However, Millie Jackson’s luck was about to change. 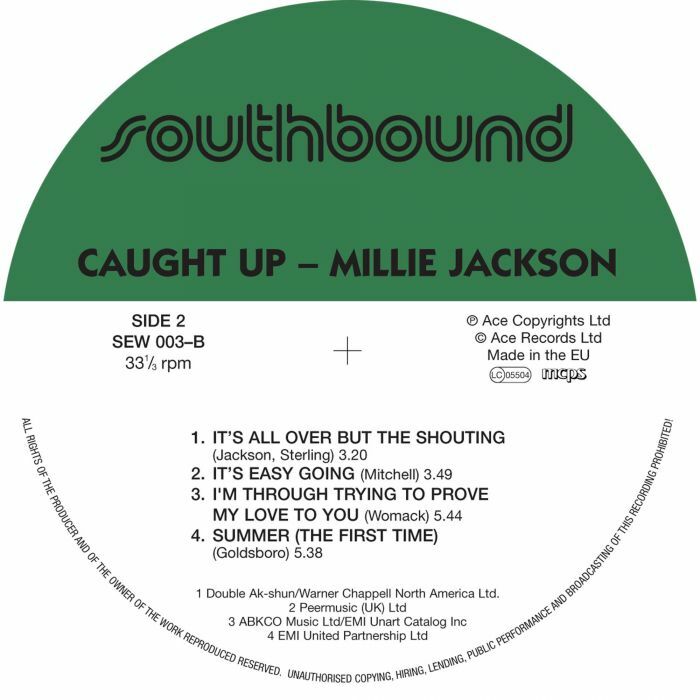 For her fourth album, Caught Up, which was recently reissued on vinyl by Southbound Records, an imprint of Ace Records, Millie Jackson decided to record one of the first soul concept albums. Caught Up documents the story of a woman having an affair with a married man. On the first side Millie Jackson sings from the mistress’ point of view and on the second side the story is told from the wife’s point of view. Essentially, Caught Up was the musical equivalent of a mini soap opera, where Millie Jackson plays both roles. For Millie Jackson’s concept album Caught Up, nine tracks were chosen including Homer Banks, Carl Hampton and Raymond Jackson classic (If Loving You Is Wrong) I Don’t Want to Be Right which opened the album and was added later as a reprise. Millie Jackson penned The Rap and wrote All I Want Is A Fighting Chance and t’s All Over but the Shouting. These tracks were joined by Bobby Womack’s I’m Through Trying to Prove My Love to You, Bobby Goldsboro’s Summer (The First Time) and Phillip Mitchell’s So Easy Going, So Hard Coming Back. He also teamed up with Billy Clements to write I’m So Tired Of Hiding. These tracks were recorded by some of the top musicians of the day, the Muscle Shoals Swampers. It was a masterstroke bringing the Muscle Shoals Swampers onboard for the recording of Caught Up which began in 1973. They had played on numerous hit singles for the great and good of music and brought with them a wealth of experience to Muscle Shoals Sound Studio and the Criteria Studios in Miami. Millie Jackson was hoping that the rhythm section of drummer Roger Hawkins, bassist David Hood, guitarist Jimmy Johnson and keyboardist Barry Beckett would work their magic one more time. Adding percussion was Tom Roady and Brad Shapiro who co-produced Caught Up with Millie Jackson. Sweetening the arrangements with strings were Brad Shapiro and Mike Lewis. As the sessions began, Millie Jackson embraced the two roles singing the first side from the mistress’ point of view and the second side from the wife’s point of view. Over the next few weeks and months Millie Jackson lived both roles brilliantly, breathing life, meaning and emotion into the lyrics which she delivered and passionately. The Muscle Shoals Swampers watched on as this musical equivalent of a mini soap opera unfolded before their eyes. Little did they know when Caught Up was completed in 1974, that they had witnessed history being made. When critics had their say on Caught Up, it received critical acclaim from the majority of critics who realised that this was an important and innovative soul album. There were very few soul concept albums, and Millie Jackson who was still a relative unknown as a pioneer. However, she wasn’t going to be an unknown for much longer. Upon the release of Caught Up in late 1974, the album reached twenty-one in the US Billboard 200 and number four in the US R&B Charts. This resulted in Millie Jackson receiving her first ever gold disc after Caught Up sold over 500,000 copies. Caught Up also The album spawned the hit singles, If (Loving You Is Wrong) I Don’t Want To Be Right which reached forty-two in the US Billboard 100 and was nominated for two Grammy Awards. However, neither The Rap nor I’m Through Trying To Prove I Love You charted which was a disappointment for Millie Jackson. However, she was well on her way to securing superstar status after her performance on Caught Up. The first side of Caught Up which opens with If (Loving You Is Wrong) I Don’t Want To Be Right, finds Millie Jackson singing from the other women’s point of view. Before that, the understated arrangement builds and drums, sweeping strings and braying horns builds combine and reach a crescendo. This is the cue for Millie Jackson to deliver a vocal tinged with sadness. Later, her vocal grows in power and she unleashes a vocal that is a mixture of sadness, anger, frustration, disappointment and emotion. In doing so, she delivers one of the finest covers of this song and one worthy of two Grammy Award nominations. This gives way a brief Reprise of If (Loving You Is Wrong) I Don’t Want To Be Right, which quickly builds as guitars scream, horns blaze, a Hammond organ swirls and strings sweep and swirl. Meanwhile, Millie Jackson unleashes another emotive vocal where she lays bare her soul. All I Want Is A Fighting Chance features a powerful driving arrangement as Millie Jackson confronts her love rival, telling her all she wants is a fighting chance to win and wow him. Behind her, the tempo quickens as braying horns sweeping strings and the rhythm section join they searing guitar. They combine elements of soul, funk and even rock, and somehow, manage to match Millie Jackson’s anger, frustration and passion. Closing side one of Caught Up is I’m Tired of Hiding, where Millie Jackson talks to her lover, telling him that she’s tired of sneaking around, hiding and longing for him, when he’s not around. Her delivery is full with emotion, but this time, she’s tired, fed up and unsure of their future. Her voice lacks the power and strength, but makes up for it with her heartfelt delivery of the lyrics as the arrangement veers between subtle and understated to dramatic and tinged with sadness. By then, Millie Jackson seems resigned that the affair might be over, and risks everything with the ultimatum, it’s her or me. After that, she becomes subdued, emotional as she’s overcome sadness and regret on one of the most powerful and moving tracks on Caught Up. On side two of Caught Up, Millie Jackson plays the wife and “wronged woman,” whose husband has been cheating on her. Bad news awaits Millie on It’s All Over But the Shouting, with her husband cheating on her, and her marriage all but over. This is played out against a driving arrangement where the rhythm section, rasping horns, percussion and chiming guitars provide a backdrop for Millie Jackson. He vocal os full of anger and frustration as she tells her cheating husband their marriage is over, and she won’t be staying with him for the sake of the kids. Not when: “he’s been practicing baby-making” with someone else. Her powerful, angry vocal is supplemented by soulful backing vocals and a fast, furious and hugely stirring, hook laden arrangement which opens the second part of this soul soap opera. So Easy Going, So Hard Coming Back sees dialogue between Millie Jackson and her husband whose trying to win her back. This isn’t going to be easy as she’s determined to keep her pride in tact. Meanwhile, the arrangement is slow, atmospheric and understated as Millie Jackson’s vocal which is full of sadness and regret, as she realises that she’s deceived herself, having turned a blind eye at his unfaithfulness. 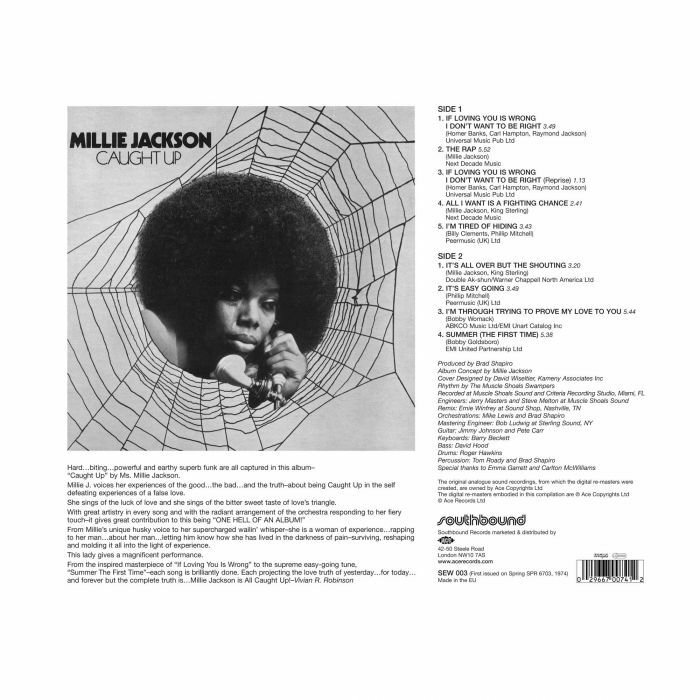 Millie Jackson brings to life the drama, sadness and mistrust of the situation, as she delivers an emotive and impassioned vocal during this heart-wrenching song which she makes her own. Having realised that their marriage is over, I’m Through Trying To Prove My Love To You finds Millie Jackson moving on, having met someone else, someone better, more reliable. During the song, she sings about how she had to move on, how she had to end the marriage, because she’s through with his cheating and deceiving, and unwilling to keep proving she loves him. Ultimately, she wants them to remember the good times, and move on with life as she delivers her vocal against a quite beautiful understated arrangement. Caught Up closes with Summer The First Time which starts off understated before becoming dramatic and soulful. Setting the scene is the Muscle Shoals Swampers who provide a full and dramatic arrangement as Millie Jackson enters, and sings of a young woman of seventeen being seduced by an older man of thirty-one, and being transformed into a woman. Meanwhile, backing vocalists add a contrast to Millie Jackson’s voice as she recreates the drama, passion and emotion of If (Loving You Is Wrong) I Don’t Want To Be Right, and transforming the song into something very different and full of drama, emotion and soul. It’s the perfect way to end Caught Up, Millie Jackson’s concept album and soap opera. Caught Up is a captivating mini soul soap opera that sees Millie Jackson transformed from the “other woman” on side one, to wronged woman of side two. The album traces the two relationships and the various stages they go through. From the opening bars of If (Loving You Is Wrong) I Don’t Want To Be Right, to the final notes of Summer The First Time, she recreates a range of emotions, ranging from the defiance, frustration and passion of side one, to the anger, betrayal and forgiveness of side two. Regardless of the emotion, Millie Jackson recreates it brilliantly, making each song her own, transforming the lyrics and bringing the song to life. 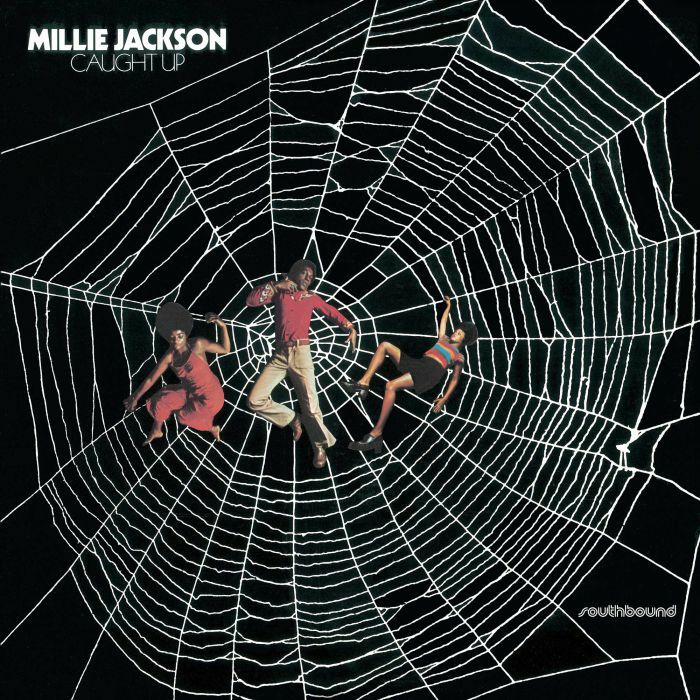 In doing so, Millie Jackson the slickest of soul concept albums, Caught Up, where one song segues seamlessly into another, as the next chapter in this drama about to play out in front of you. Millie Jackson along with co-producer Brad Shapiro were responsible for an album that record buyers in 1974 were unable to tear themselves away from, just in case they missed the next twist in this tale of love, love lost and betrayal. 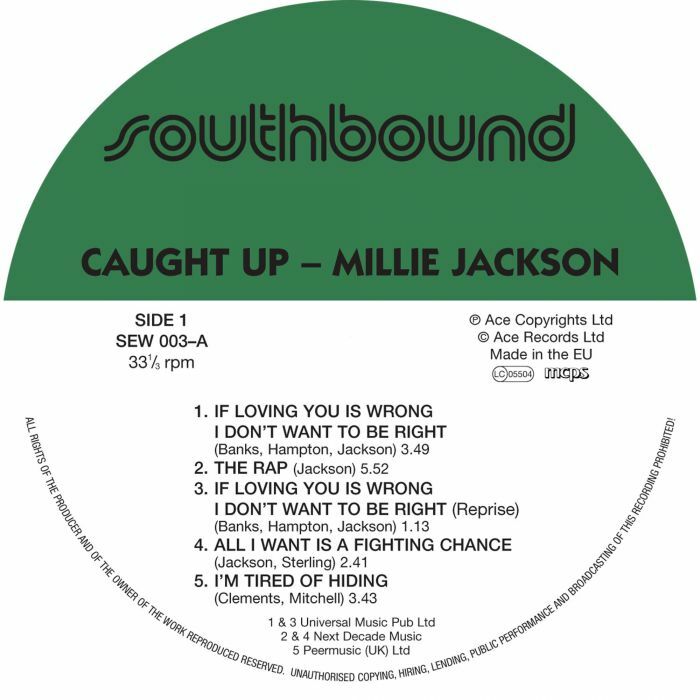 Over 500, 000 people bought a copy of and tuned into Millie Jackson’s mini soul soap opera Caught Up which has just been released on vinyl by Southbound Record, an imprint of Ace Records. This is a welcome reissue of Caught Up, which one of the greatest soul concept albums ever released, and the album that launched the career of Millie Jackson when it was relaxed in 1974.